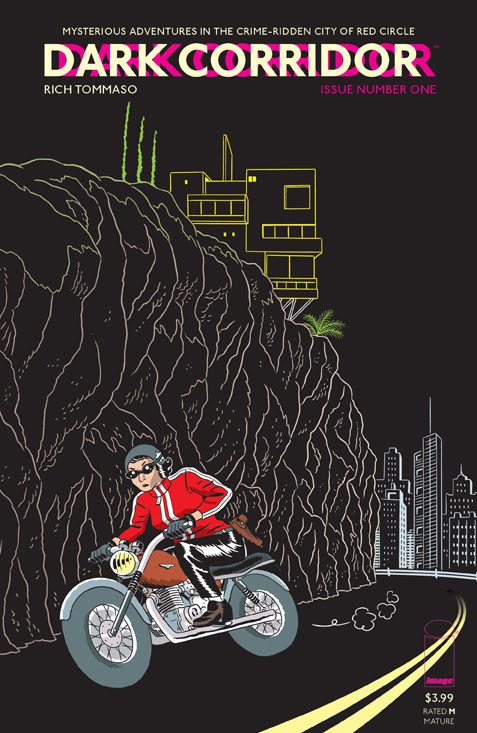 Rich Tommaso is bringing his newest project, Dark Corridor, to Image Comics. He has taken the time to answer questions about this book, giving some insightful answers about this new series and his deep experience working in independent publishing. 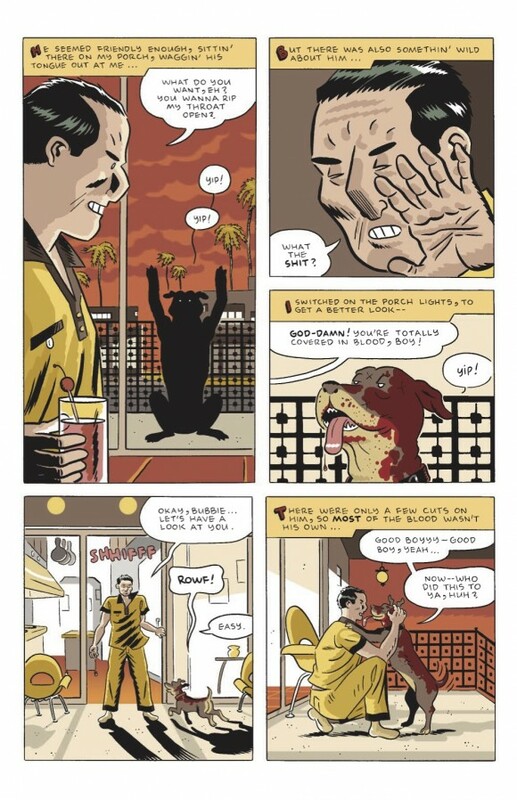 For years, Rich Tommaso has pounded the indie-publishing scene, producing works ranging from Chanlder-esque noir to surreal horror to personal narratives, all with his signature minimalist artwork and character-driven stories that explore flawed persons dealing with incredible circumstances. Tommaso’s work often has a visceral feel due to the fact that his heroes — or more aptly anti-heroes — are so consistently raw; his series are bottom-up explorations of often marginalized segments of the society and the characters who inhabit them. Having put out a number of critically acclaimed works — books like Clover Honey, 8 1/2 Ghosts, and Satchel Paige: Striking Out Jim Crow, just to name a few — Tommaso started his own self-publishing company, Recoil Comics, a few years ago, before bringing his newest project, Dark Corridor, to Image Comics, which is slated for release this Wednesday, August 5. This new series is a bit of a return to the genre that launched much of Tommaso’s career, namely fictionalized explorations of the seedier elements of the world of organized (and, at times, disorganized) crime. The first issue is an exciting glimpse at what the series can offer: it is shrouded in mystery with great bits of classic noir, with an ensemble cast of characters who are, somehow, simultaneously terrifying and likable. The books feels somewhat anachronistic but also timeless, evoking a sense of Matt Kindt’s Pistol Whip set in a world filled with Tarantino characters, but reading like classic Tommaso. This may be high praise, but it is well-deserved, even after just one issue. Rich Tommaso: Dark Corridor is an umbrella title and is used, much like The Twilight Zone, to house different stories of various genres. 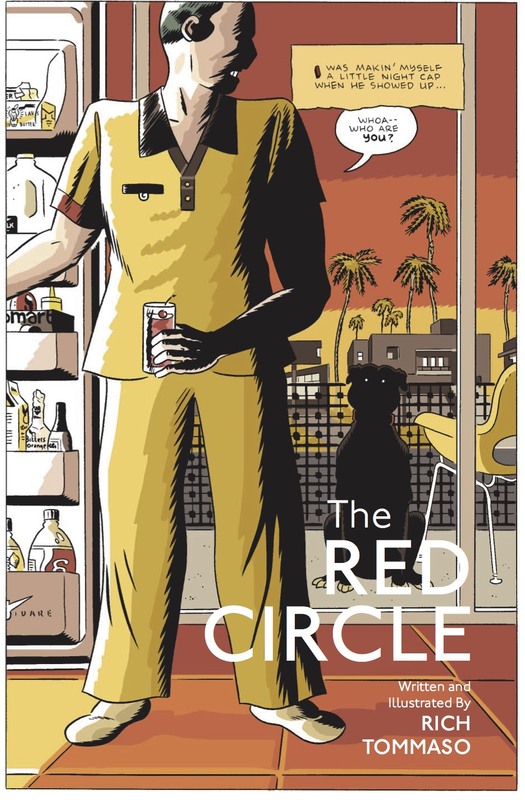 It’s first long-running feature, The Red Circle–a sprawling, crime drama about revenge and the destruction of the male-dominated mafia– will eventually end and another, completely different story will take it’s place. One that may be crime or science fiction or horror–who knows? G.D.: In the first issue, you briefly introduce a group of characters called the 7 Deadly Daughters. Who are the Daughters? Is there anything in particular that you were drawing on in creating these characters? Rich: That idea came to me while watching the 1947 version of Kiss Of Death on TCM about eight years ago. In the beginning of the film, Victor Mature gets arrested on a jewelry store heist and is sent to prison for three years. When he gets out, the police take him to see his two daughters, who’ve been living in a home for wayward girls. G.D.: What is about this style that keeps bringing you back? Rich: For a long time, I had made very personal comics. I’d struggled with autobio (or fictionalized autobio) comics and eventually had to come to terms with the fact that–no matter what aspirations I had of being a writer of what I call, “straight fiction”–I just wasn’t very good at it. Not to say that my crime work isn’t personal. It’s ALL personal, but I think I work better when I’m penned in by the limitations that genre fiction provides. I’ve read many crime novels and have seen–even more–crime/noir films over the years. It’s a genre that sparks most of my ideas for comics. I think for me it’s all about the fear of that world. I’ve never been to jail and I can’t imagine doing something criminal that would most likely put me there. I’ve worked many a crappy, manual labor job in my lifetime and resigned myself to my fate and to the fact that there was nothing much I could do about it. So, It just fascinates me that someone would do something highly illegal, that could land them in prison where some the scariest of humanity reside and all because basically, they’d rather not work a day job. G.D.: Your crime drama work has a distinctly classic literary noir feel to it. Are there any particular sources that have been influential in creating these stories? Rich: I’d have to say that my major influences would be the crime novels of Charles Willeford–especially Miami Blues and Pick Up. The thing that’s so great to me about Miami Blues is how it turns out to be just barely a crime novel. The minute details Willeford describes about the actual, daily job of being a detective is the most interesting part of that novel for me. Also, David Goodis–everything by Goodis. He was always trying something different–many of his stories feel like a typical noir yarn at first, but then turn out to be these inventive contemplations on human behavior. Ross MacDonald’s The Underground Man is another one too. There are some beautiful sequences in that novel that totally transcend the crime genre. He wrote from the late 40’s into the 70’s, but his works from that later period is what I find to be most interesting. Which is, no doubt, due to his personal sufferings of that period–from marital depression to his daughter getting caught up in a vehicular homicide incident and subsequently going “on the run” from the police for days. G.D.: Thematically, your stories often deal with flawed characters attempting to overcome the their situations, often in the middle of a challenging circumstances pushing against them accomplishing this. Why is this theme so appealing to you? Is this a concept that we should expect to see in Dark Corridor? Rich: Failure, depression and regret are things I suffer from, yet thrive on. I work best and break out of ruts when I feel I’m forced to. If I’m being tied down to an 8-hour-a-day, six-day-a-week restaurant job, even though a lot of my time is being taken away, eventually I will strive to find ANY pocket of time I can to make art. In the case of my self-publishing venture, I was striving to just get my comics into people’s hands again after every publisher I’d once worked with, lost all interest in publishing my stuff. The comic business is such a frustrating one to navigate through–especially for someone who absolutely loves to do it and can’t do much of anything else. It also creates problems in personal relationships. I don’t know how many arguments with girlfriends I’ve had over the years about just why the hell I was spending so much of my time drawing comic books, which gave back almost nothing, monetarily, in return. So, these themes just bleed into my characters, even if I’m barely aware of it. G.D.: Narratively, I found it interesting how the first issue opened from the perspective of one individual, Pete, who the reader automatically assumes is the protagonist, but by the end of the issue, I’m not even sure that Pete will be more than a footnote in the series. Why open the series in this manner? Rich: Without giving too much away, Pete is an important part of the story, even though dozens of new characters also enter the picture with equal importance. 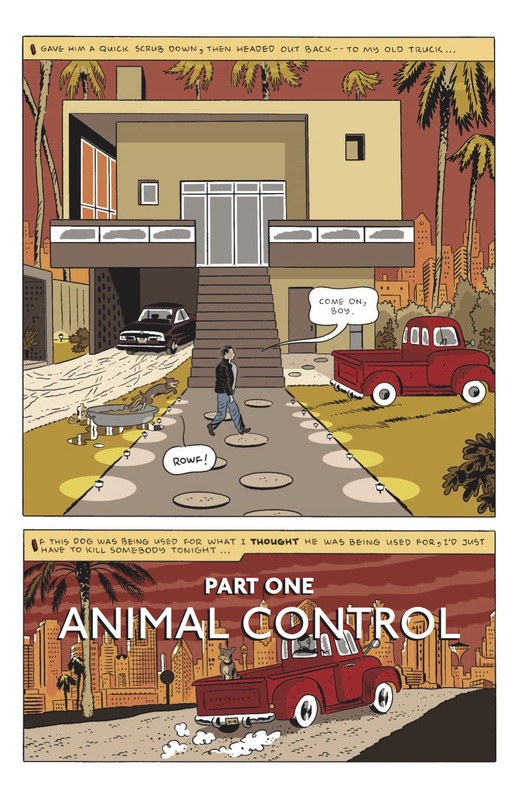 The spring board of the lost dog coming to Pete’s doorstep seemed like a strange and mysterious way to open a story–much like a Crime SuspenStories opener– but, this sequence also becomes an interesting metaphor a little further on. G.D.: Dark Corridor is billed as an ongoing series, which is a bit different than so many of your prior works, which have been graphic novels. How have you found the transition from graphic novel to ongoing series? Do you have a specific end-point for Dark Corridor in mind? Rich: When I started Recoil Comics, I was doing six different comics in 24-page installments. I found that it was so much easier writing these little story arcs than writing one gigantic book all at once. I never became comfortable with the graphic novel format as a starting point. It was too endless–sometimes I would lose myself in certain themes of one chapter or another–and go off on tangents, leaving the main point of the story, far, far behind. I tended to get sick of working on a specific project after a year or so and often ended those novels before they were really finished. With the Recoil Comics–and now, with Dark Corridor, I’ve become more organized–I write scripts first, I plan things out in thumbnails–and these are things I’d rarely done in the past and alwayshated doing. Mostly because writing a tight script for an entire 100-200 page graphic novel had always been way too restricting and wouldn’t keep the story “fresh”or open to new avenues. Alternatively, making things up as I went along, also did not yield great results. It’s easier the way I’m working now for me to plan things out in piecemeal–to keep sequences concise and to find my way in and out of a chapter. I don’t have an endpoint for Dark Corridor, but I do have many for The Red Circle, Seven Deadly Daughters story lines. The way I’m writing these pieces, they could either end in six issues, twelve or go on for much longer. I have a lot of material for these stories, but I’m going to let the success or failure of these first six issues determine just how long they’ll run in Dark Corridor. G.D.: You started your own publishing company, Recoil Comics, not all that long ago. Can you tell us a bit about the experience of running your own publishing company? How did it come about that you opted to publish Dark Corridor with Image instead of self-publishing? Rich: From 2009-2013, I was working on several different comics, but like I said, had nowhere to publish them. After almost twenty years in this profession, I realized I had to go back to year one–that apart from making these comics, I would have to print, assemble, promote and ship these things myself. In the summer of 2013, I started out by printing a one-shot comic, Don’t Look Back! –a horror spoof about the perils of reconnecting with an ex girlfriend or boyfriend. I then phoned up every retailer I knew or could find online, who seemed open to the idea of selling mini comics. After assembling a nice list of about 25 shops from around the country, I was confident in going ahead with my plan, which was to publish six comic books, bi-monthly. I did all of the work myself, along with the help of my girlfriend, Amy, who kept track of orders placed by retailers. It was a lot of work, but also very rewarding to see these comics produced only after a few days of having drawn them. The hardest job was designing the books. Graphic design was something I wasn’t very experienced with–and a lot of those covers underwent many revisions. Joe Keatinge had been picking up my mini comics in Portland and started emailing me about how much he was enjoying them. This led to Joe asking me to do a back up story for his new comic, Shutter (by the way, that back up, Small Time, is where Dark Corridor’s Pete first appears) and later showing Eric Stephenson my work. Months later, Eric asked me if I’d be interested in doing something over at Image. Looking at what was being done over there, Image seemed like the perfect place for a cartoonist like myself–who was moving in a somewhat opposite direction than say, David Mazzucchelli. I was very excited about this because it was one of the directions I was hoping Recoil would lead me into. Of course I daydreamed of Recoil being successful and financially stable enough to stand on its own two feet, but this seemed like an unlikely outcome. My realistic dream was that it would lead me back to a professional publisher–but not back to an independent publisher whose readers–for the most part–didn’t care much for genre comics. I’d also become extremely burnt-out on the self-publishing game around the time Image approached me. I wasn’t making a dime, it was costing me much of my modest income and public interest in Recoil was dying out. At first, there was a modicum of attention and excitement around Recoil with readers and bloggers, but like everything else in our high-speed internet culture, that interest dried-up quickly. There’s alwaysgoing to come the distraction of the next shiny, new thing. I’m just as guilty of this as everyone else. It was the reason I was working on six different comics and why I also plan to have Dark Corridor change its course from time to time. G.D.: Other than Dark Corridor, do you have any projects on the horizon that you are excited about? Rich: No–right now I’m putting all of my writing, drawing, coloring and designing efforts into Dark Corridor, trying to make it the best series that I can. I am SO in. This sounds great.